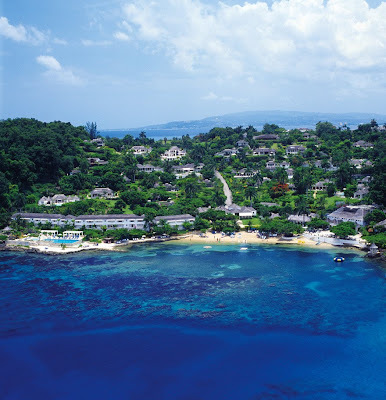 One of my best friends is getting married at Round Hill in Jamaica in May and I am ecstatic to say that I will be attending with my husband, mom, and one year old in tow. Thank you Dare for getting married and for picking such a wonderful location! 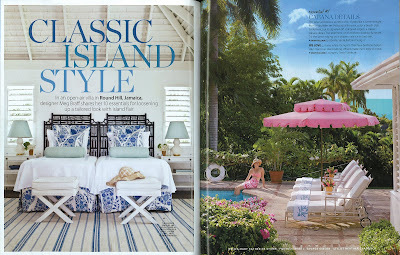 Coincidentally Coastal Living Magazine just featured Round Hill in their February 2010 issue and has released some beautiful photos (pictured above and below) of the villas designed by Meg Braff. 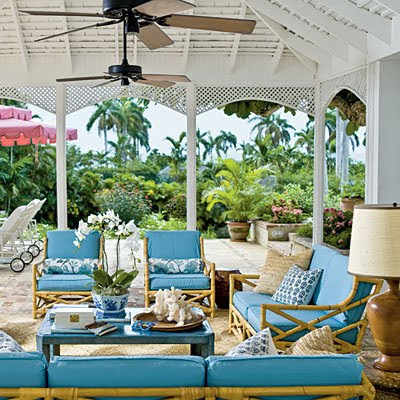 Her re-design of the resort villas were inspired by settings of the 1950's and 1960's when the Kennedys, Grace Kelly, Ralph Lauren & Paul Newman were all frequent guests. 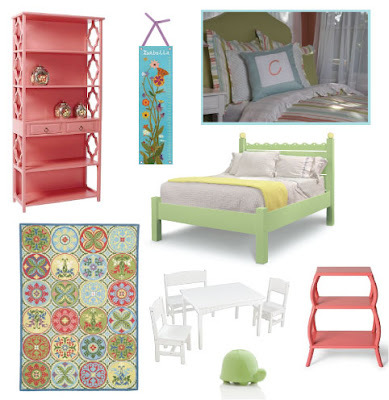 The style is crisp, polished and bright (but not overly). Basically a toned down Lilly Pulitzer. I can't wait to see the villas in person and to have a few rum beverages while celebrating the marriage of my dear friend. 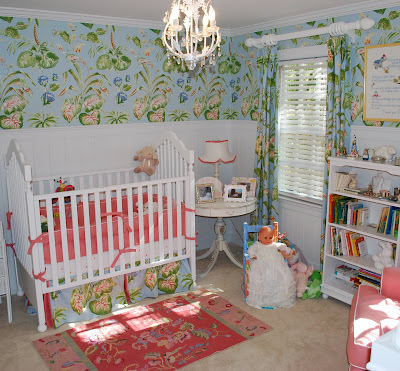 Now I have been dying to share the photos below of another special friend's daughter's nursery (she and the bride are actually best friends also) in Raleigh, NC. The similarly of the colors in the two completely different spaces is inspiring. 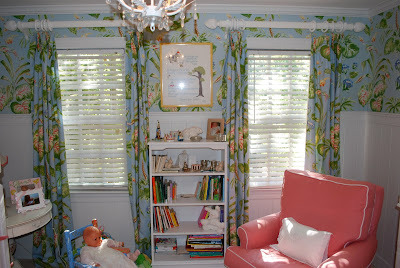 Virginia's nursery is so bright and cheerful, it almost takes you back to Palm Beach or the Caribbean. 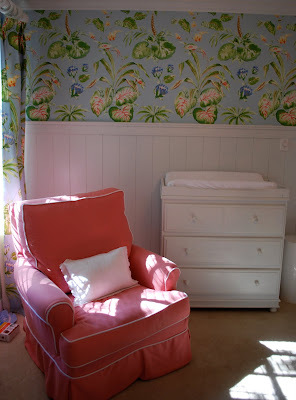 The tropical hues found in nature of palm green, coral pink, aqua blue, and banana yellow flourish on the wallpaper and on the fabric used for Virginia's bedding and glider. It actually makes me wonder if Virginia's mom was inspired by Round Hill or if this was just a coincidence that the colors match perfectly. Now since little Virginia was recently blessed with the arrival of a baby brother, she's going to need to move out of her crib into a big girl bed soon. 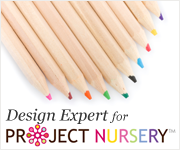 Here are a few proposed pieces of furniture and decorative accessories to help transform this beautiful nursery into a room suitable for a preschooler and beyond. Ok back to dreaming about sitting by the pool! With this grow older associated with technologies, you don't look at the bags item retailer's fake louis vuitton bags face-to-face. Lastly, would like to purchase real handbagss, the most crucial inserting stage may be the cost. A brand new Chanel handbag or even ladies handbag might price approximately several 100 in order to 1000s of dollars. Awaiting the rolex replica uk, exactly where a few products tend to be reduced as much as 60 % will be a choice for all those prepared wait around. However if you're in a rush, after that going to a good online shop which has obtained an audio come back as well as reimbursement plan is the following greatest wager. whenever you purchase these types of products on the internet, you have to be cautious regarding exactly where you acquire all of them through. Public sale audemars piguet replica tend to be digital landmines you need to prevent walking upon. Discover that websites tend to be sanctioned to market a true fake rolex for sale. The price is generally a suggestion regarding whether you're purchasing a knock-off.